I have been knitting a cowl for the past number of weeks, a stretchy tube to pull over the head and warm the neck. This particular cowl is a lacy design, with different patterns of adding and combining stitches in each of twelve rows which are then repeated to a desired length. Complete concentration is required in order to stay with the instructions for the row I am knitting. When I lose track, float off into thought, I often don’t discover the harm until the end of the row when an extra two or three stitches tell me I have gotten it wrong. Either I leave the resulting alteration in the pattern and accept my–and now the garment’s–imperfections, or, when too many of such unforced errors have been knitted in, I pull out all the rows and begin again. I have lost track of how many times I have wrecked the pattern and pulled yards of heathered purple yarn out of its looped circle shape, re-winding it into a ball to begin again. Probably five. Every start-over was accompanied with a renewed commitment to slowing down, to sustained concentration, to the suchness of knitting lace. But my lapses in knitting form continued to derail the garment. The fifth time I reversed the project, taking the cowl back to a ball of yarn, confusion also derailed my usual cool knitter’s acceptance. I felt mystified, no longer able to say what the many-week accumulation of mistakes could be trying to teach me. Within this new eco-system I’ll call, “I don’t know what’s going on here,” I began to knit the cowl for the sixth time. This time I did not begin with a strategy for how to knit “better.” I sensed a call to a deeper truth. As the rows began again to accumulate, it came to me to let go of wanting the cowl done by a date certain in order to gift it to a friend. Without a deadline looming, I felt the pressure of it lift. In the now-more-open space, I saw that the cowl and my knitting of it was only one thing: Practice. This practice, with its painful failings, was showing me that I am not in charge. Whether the pattern of slipped and looped stitches unfolded as the design I expected and wished for, or not, is not for me to say. I can do my best and let go of the rest. Practicing anything one loves, be it learning a language, playing an instrument, knitting or opening to Eternal truth, one is called to simply do the practice at hand; memorizing verb forms, playing scales, pulling out mistakes, stabilizing the mind by returning over and over to the present from our elaborate thoughts and feelings about ME. This ME is brimming with discouragement or pride, push or resistance, hindrances to sustained, regular, careful effort. 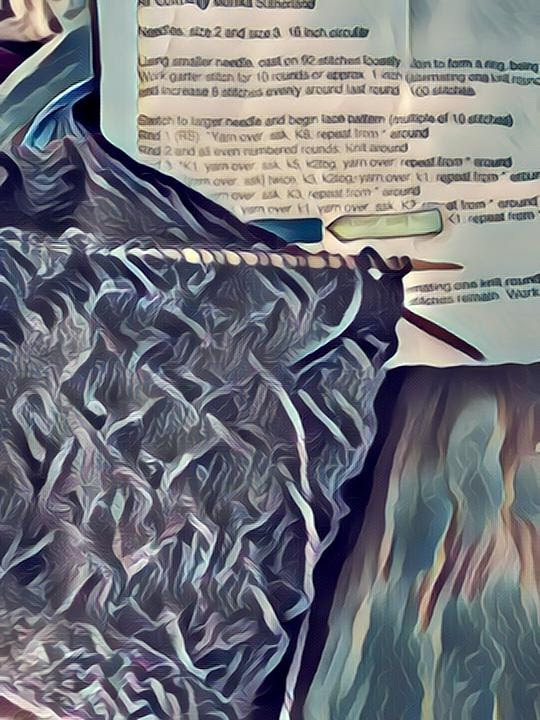 She is my primary obstacle when her reactivity colors the work at hand with “success” or “failure.” When all results are measurements of worldly gain or loss, she/I become the main barrier to the spiritual project of welcoming life as it unfolds, a knitted cowl as it unfolds. When I step around the reactive, measuring ME, in return I am given a chance to trust in the most elaborate and compassionate of all patterns. Divine guidance is the only thing I have to understand. This non-conceptual holding pattern is the source of all creation, the source of all beauty. We cannot make beauty without it yet this divine creative force does not interfere while the ego strives for its own outcome. If the lacy purple cowl project becomes a beautiful garment, I can thank my lucky stars.